Your power transmission systems are only as tough as your couplings; Luckily, Martin’s Blue-Flex™ Grid Couplings were designed with strength in mind. 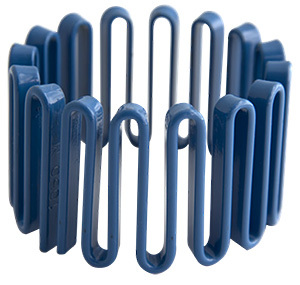 Made from high-strength steel tempered for long life, with a blue color for added visibility, this general purpose Martin grid coupling is built to handle up to 1,650,000 in. lbs of torque in its compact package size. 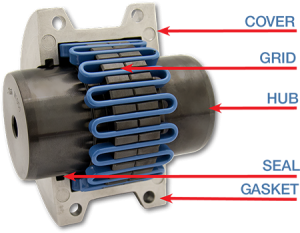 Comprised of two hubs, a grid spring element and split cover kit, common applications for Martin grid couplings include pumps, conveyors, compressors and fans━in addition to mining applications, vibratory screens, crushers and kilns. Within the grid coupling’s core function, there’s a strategically-engineered force responsible for its ability to take on extreme levels of torque━Torsional Flexibility. As the grid coupling transmits torque, both the flexing of the tapered grid spring and the progressive contact between the curved profile of the hub teeth make it possible to absorb the impact energy and spread it out over time. 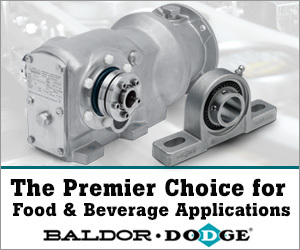 Maintained properly with coupling grease for optimum performance, this torsional flexibility allows the coupling grid to dampen the vibrations and cushion the shock loads to driven and driving power transmitting equipment components, ultimately minimizing part failure, extending the life of your machinery and saving you maintenance and downtime dollars. “Martin grid couplings are a proven technology and each component is designed to be interchangeable with all other industry grid couplings,” says Tim Zerger, IBT Bearings/PT Business Group Director, “that keeps customers from stocking multiple parts/pieces from different grid manufacturers.”. The grid bears the stress near the outer edge of the hub teeth. The long span between the point of contact remains free to flex under load variations. As the load increases, the distance between contact points on the hub teeth is shortened, but a free span still remains to cushion shock loads. The coupling is flexible within its rated capacity. Under extreme overloads, the grid bears the stress on the hub teeth and transmits full load directly. With the ability to adapt to different loads, while maintaining efficiency, in addition to their standardized design across the industry, these Martin grid couplings ensure both operational reliability and hassle-free replacement, regardless of the job. An added value of the Blue-Flex design, according to Zerger, is its ability to accommodate parallel misalignment issues within its capacity. The resilient movement of the grid in the hub grooves permits a rocking and sliding action, without a loss of power. The grid accommodates combinations of misalignments present at set-up or occurring during machine displacement, settlement etc. End float is also tolerated for both driving and driven shafts as a result of the freely-sliding grid within the lubricated grooves. The Martin and IBT partnership goes back to the early 1950’s, as Martin Sprocket is one of IBT’s oldest suppliers. “We have long relationships with our suppliers, as we have with customers, and those go hand-in-hand,” says Stephen Cloud, current IBT Chairman of the Board. As an industry-leader in couplings today, Martin has grown to include a number of distribution centers and machining facilities strategically located across the USA and worldwide. Every warehouse in North America has complete product line inventory and the ability to manufacture or custom-alter parts with complete machining. Martin’s commitment and dedication to making their products available to distributors like IBT help make it possible for us to supply our customers with the parts that get them back up-and-running━as early as the same day. Mechanical Power Transmission has been a cornerstone of the IBT Industrial Solutions business since the company was founded in 1949. If you’re looking for the knowledge and expertise you need to keep your applications up-and-running, contact us today!